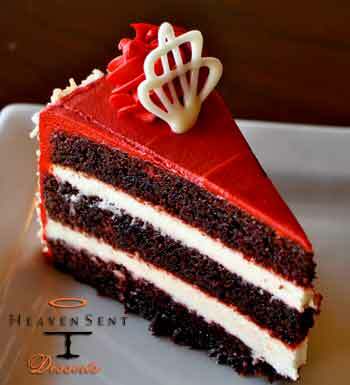 Heaven Sent Desserts features its Red Velvet Cake by the slice this May 30th. It's rich, it's smooth, it's amazing. The special cream cheese filling is a sotto voce glissando experience from Heaven ... decorated with a rich chocolate phesel. And you will be well able to indulge in more than one slice at this special 30th on 30th price! Don't forget our regular special Afternoon Delight: Choose one of 3 desserts and house coffee or tea for only $6.00; or bring a friend for $10.00!